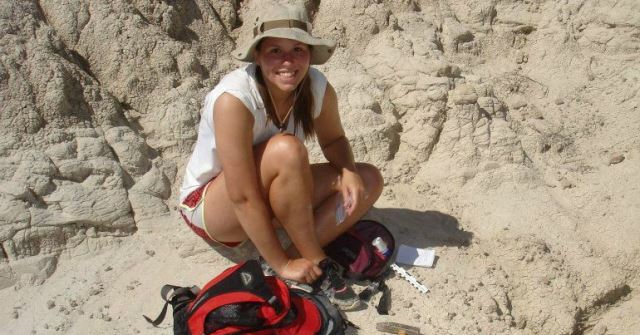 Malorie Smith ’16 (above) participated in last year’s paleontology expedition. This summer, Dr. David Schmidt, Assistant Professor of Environmental Science and Geology at Westminster, will take a group of 9 students to the Badlands to participate in a paleontology expedition. The second Westminster group to explore the areas, Schmidt’s team of 2015 students will follow up on some of the work undertaken by last year’s Westminster group and will continue prospecting for new sites and specimens. Last year’s group collected more than 200 fossil specimens, as well as a vertebrate micro-site including fish, crocodiles, dinosaurs, and other vertebrates. Such a micro-site is important to science because it provides a thorough representation of what the ancient environment was like. This year’s expedition group will leave July 20th and return August 5th. It will include students Meredith Bolen ’16, Devin Brown ’18, ChristiAna Dunham ’18, Kristen Hirst ’18, Hannah Hubbard ’18, Jessica Kinkade ’18, Tjikuzu Tjizembua ’16, Sawyer Young ’18, and Yuchen Shang ’18.